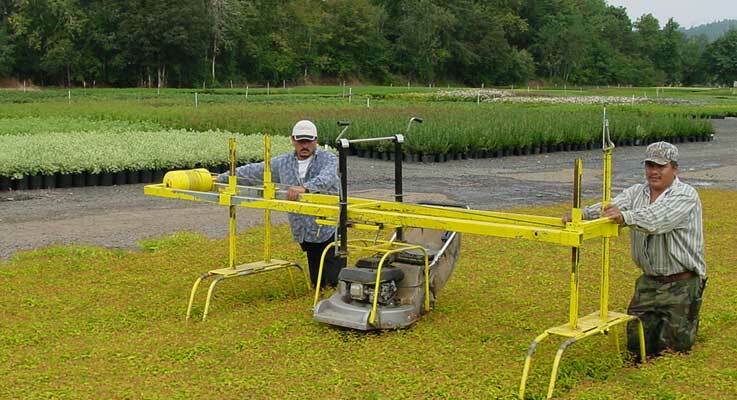 Employees at Van Essen Nursery Co. use a custom-designed lawnmower apparatus to move down the rows of containerized plants and shear them to a uniform height. Plants have personality. Each one grows at its own speed and habit. For the wholesale nurseries turning them out by the hundreds of thousands, that’s not necessarily a good thing. After all, customers tend to value an individual plant’s quality, rather than its quirks. In this uniformity-equals-quality world, grading is the first key to success. At every opportunity, from propagation to pulling orders, growers need to assess size and health and weed out the weak. “Each time you touch a plant, you have the opportunity to grade it,” said Buchholz. That’s a lot of chances for sorting! During its life at a nursery, a plant moves from liner or plug to ultimate commercial size after being transplanted several times. Humans put hands on the plants several more times for spacing and pruning. Even truck-loading time offers an opportunity for sorting. At Oregon Pride Nurseries in McMinnville, salespeople and other staff who interact with customers make one final inspection of the plants as they are being readied for loading. If a plant or block of plants isn’t up to par, it isn’t shipped. The challenges of consistency are many. Labor, shipping and weather can drive a nursery owner crazy. Lee knows exactly what Van Essen means. He cited the weather in the Willamette Valley last year when it rained constantly in May, keeping them from their scheduled fungicide applications — an unfortunate situation in an area where rainy springs already complicate disease control. But it’s not just the local conditions that can pose problems. A bad forecast on the receiving end can be just as aggravating. No matter how ready the plants may be, they can’t be shipped if the weather is terrible on the customers’ end. Like all growers, Robinson Nursery wants to ensure that customers receive what they ordered. To that end, the company started switching out some of their 300-variety stock of trees and shrubs from bare root to container grown using an innovative pot that allows roots to grow through slits in the side and be dried — or pruned — by the air. That allows for more direct application of nutrients and water, which makes for more uniform plants and allows the company to produce trees that don’t do well when grown bare root. Pruning is another area where uniformity can be graded. Machines, for some growers, are the way to go. Not only are they fast, they are also precise, according to Matt Gold of Gold Hill Nursery in Hillsboro. Once the parameters are programmed, the machine cuts to produce a cookie-cutter crop that satisfies the customer’s demand for uniformity. Optical sensors, calibrated for size, leaf density and color, are used in tractor-mounted systems and even drone applications. These machines help with inventory and sorting, which improves crop consistency. The cost of such state-of-the-art systems is about the one-time price of a small, year-round grading crew. “You can purchase an optical plug-grading machine, significantly improving the quality of transplanted liners while at the same time easily quintupling the output of the grading process,” Buchholz added. Robots, which take on the task of spacing container plants, cost about half the yearly cost of a seasonal worker and can be employed full time, which makes it possible to complete critical work on schedule. Machines are widespread and robots on the rise, but simple tools work, too, said Buchholz. He has used bamboo stakes, foot-long Felco grass shears, even marks on Levi’s to teach staff to measure pruning height correctly. “It takes out the variability of what this person thinks versus what that one thinks,” he said. Training is important. Robinson said when the nursery was smaller they could count on employees to load an order of plants of the same size, shape and high quality. Since the company has grown, maintaining this uniformity has become more difficult. With so many different people pulling orders now, it’s become necessary to mark plants with tags or paint codes. Workers refer to the pull sheet and match the colors to the plants. Trained labor is essential when it comes to weed and pest control, too. As Robinson pointed out, shipping plants with pests or diseases can wreak havoc in the area where it ends up. That’s not good for business. To get a leg up on pest control, Oregon Pride was one of the first nurseries to get accepted into the Grower Assisted Inspection Program (GAIP) through the Oregon Department of Agriculture (ODA). Growers have to take a proactive approach on plant health by training employees, having a team of scouts documenting pests and implementing best practices. It’s expensive to get a handle on pests, especially weeds. Gold estimated that controlling weeds costs three to four times more than other pest issues, most significantly on labor for hand weeding. As well as scouting, cultural practices minimize pests and diseases. All diseases need three things: the right pathogen, the right host and the right environment. If you’ve got the trinity, contamination will be high. If you reduce pest-friendly environments, you can minimize problems. Keeping plants spaced appropriately to give them good air circulation is important, Gold explained, as is avoiding over-watering. Much of what separates a so-so nursery from a successful one is consistency, which is driven by an eye for quality and an ear for customers. At every turn, that consistency comes from grading plants into the same size and similar shape.